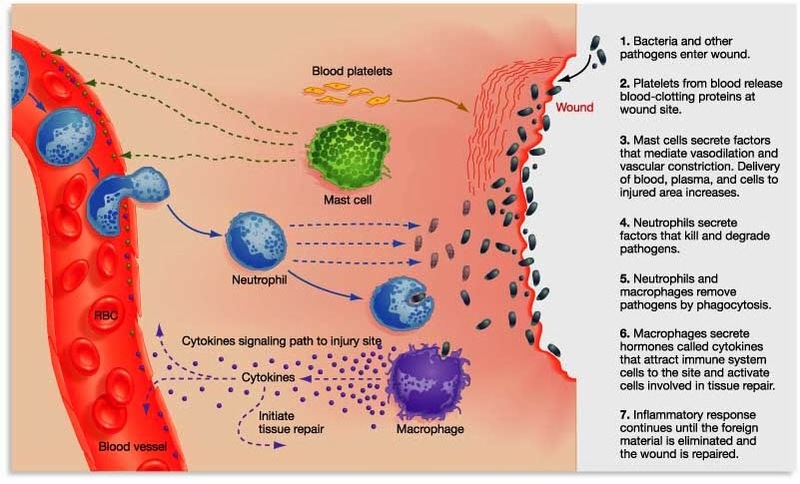 Inflammation is part of the immune system’s response to damage or infection. It is a very natural process that our bodies undergo when we come into harms way. Researchers at the University of Queensland, have recently demonstrated something interesting about the inflammation associated with Parkinson’s: by inhibiting a very specific part of the inflammatory process, they can reduce the spread of Parkinson’s associated alpha synuclein pathology in models of PD. And they have developed a drug – called MCC950 – that specifically targets that component of the inflammation process which they are now seeking to test in clinical trials. In today’s post, we will discuss what inflammation is, review this new research, and consider what it could all mean for the Parkinson’s community. When cells in your body are stressed or sick, they begin to release messenger proteins which inform the rest of your body that something is wrong. When enough cells release these messenger proteins, it can cause inflammation. Inflammation is a vital part of the immune system’s response to trouble. It is the body’s way of communicating to the immune system that something is wrong and activating it so that it can help deal with the situation. By releasing the messenger proteins, injured/sick cells kick off a process that results in multiple types of immune cells entering the troubled area of the body and undertaking very specific tasks. The strength of the immune response depends on the volume of the signal arising from those released messenger proteins. And the level of messenger proteins being released partly depends on multi-protein structures called inflammasomes. Inflammasomes are multi-protein formations that are present inside of cells in your body. They detect pathogenic agents or stressors that have found their way inside of cells, and once these inflammasomes detect something that should not be there, they activate the release of highly pro-inflammatory messenger proteins (called cytokines) such as interleukin-1b (IL-1b) and IL-18. These cytokines are released into the world outside of the cell and alert the immune system that something is not quite right. There are difference types of inflammasomes and they vary based on what activates them. For example, the presence of RNA from a particular virus may activate one type of inflammasome, while a certain toxin will cause the assembly of a different inflammasome. For the purpose of keeping things simple in today’s post, we are going to focus on one of the most well characterised inflammasomes. The name of this particular inflammasome is derived from one of the three core components: a protein called NLRP3. NLRP3 is an abbreviation that is a lot easier to say than “Nucleotide-binding domain, Leucine-Rich-containing family, Pyrin domain-containing-3“. a zymogen procaspase-1 (don’t panic about how complicated this last one sounds just yet, we’ll come back to it in a second!). NLRP3 is a sensor protein. It act as a “pattern-recognition receptor“. That is to say, NLRP3 is a protein that recognises a particular pattern in the shape or structure of certain ‘activators’ (think, a virus or stressor). These activator patterns are called pathogen-associated molecular patterns (or PAMPs). There are many different forms of sensors, which help to recognise all the various patterns of troublesome agents. When NLRP3 protein is first produced by a cell, it floats around in an inactive state waiting for PAMPs to interact with it and activate it. Once activated, the NLRP3 protein will start binding to other activated NLRP3 proteins and this is the beginning of the formation of a NLRP3 inflammasome. What is the adaptor protein? 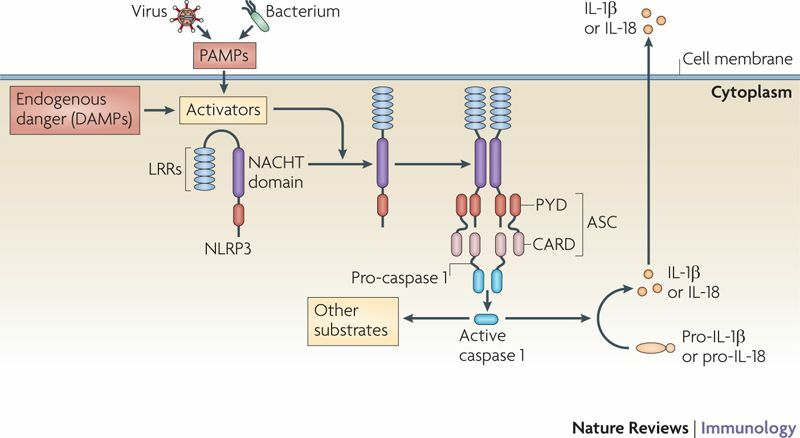 In the NLRP3 inflammasome, there is a protein called PYCARD, which is sometimes referred to as ASC (or “Apoptosis-associated speck-like protein containing a CARD”). For simplicity sake, for the rest of this post, we will refer to the adaptor protein in the NLRP3 inflammasome as ASC. An interesting feature of the adaptor protein ASC has recently been shown to act in a prion-like fashion (Click here to read more about this). Emerging evidence suggests that ASC is also released from inflammasome‐activated cells as ‘ASC specks’. These ASC specks accumulate in inflamed tissues, where they can continue to encourage the production of mature cytokines. There is also evidence of interactions with other proteins (more on this near the bottom of the post). When the NLRP3 protein becomes activated and starts binding to other activated NLRP3 proteins, ASC will bind to it and this process attracts the zymogen procaspase-1. Ok, now can I panic? That sounds really complicated. What is the zymogen procaspase-1? A zymogen is simply an inactive precursor of an enzyme, and procaspase-1 is the precursor to the enzyme caspase-1. Caspase-1 is the enzyme that causes the release of the proinflammatory messenger protein (the cytokines that we mentioned above), IL-1b and IL-18. 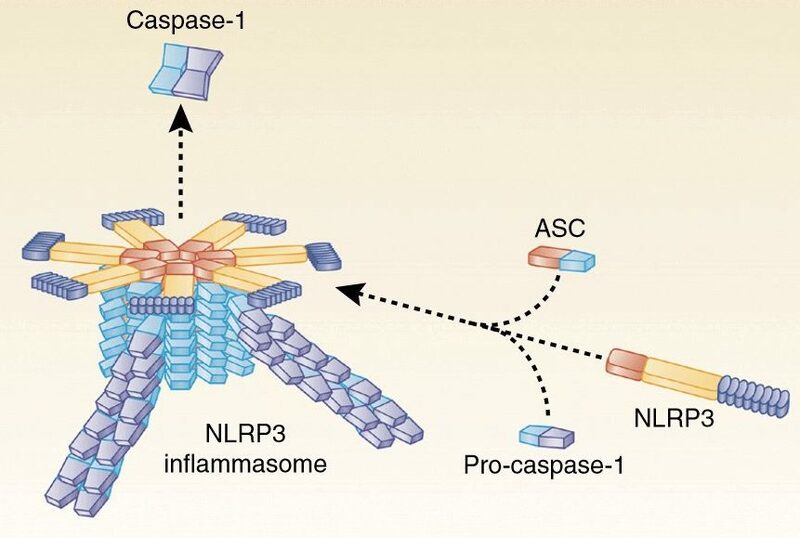 By forming an inflammasome, NLRP3, ASC, and procaspase-1 cause the activation of caspase-1 which in turn results in the release of proinflammatory cytokines. Over activation of inflammasomes is associated with several autoinflammatory and autoimmune conditions, and there are numerous efforts being made to develop therapies that target inflammasomes (as we shall see below). And the consequences of over activation of inflammasomes is serious. Recently we discussed all of the different kinds of ways a cell can die (Click here to read that post), and inflammasomes cause a form of cell death termed pyroptosis. Pyroptosis differs from other forms of cell death in that it requires the activation of the enzyme caspase-1, and (as we discussed above) caspase-1 is activated during pyroptosis by inflammasomes. For those interested, click here to read a brief review of evidence of pyroptosis in neurological conditions. But how is NLRP3 associated with Parkinson’s? Title: Triggering of inflammasome by aggregated α-synuclein, an inflammatory response in synucleinopathies. Authors: Codolo G, Plotegher N, Pozzobon T, Brucale M, Tessari I, Bubacco L, de Bernard M.
In this study, the researchers wanted to investigate how the Parkinson’s associated protein alpha synuclein could cause inflammation. In this form, alpha synuclein is considered a monomer – which is a single molecule, just one copy of the protein. It is capable of binding to other molecules, and when it binds to other alpha synuclein proteins, they form what is called an oligomer (a collection of monomers). And these oligomers can have different structures. In Parkinson’s, alpha synuclein also binds (or aggregates) to form what are called ‘fibrils’. And it is believed that these oligomer and fibril forms of alpha synuclein protein may go on to produce the Lewy bodies that characterise the Parkinsonian brain. In the 2013 study, the researchers exposed blood cells (monocytes, a type of white blood cell) to monomeric and fibrillar versions of alpha synuclein, and they found that both forms of the protein promote the production of the pro-inflammatory cytokine IL-1b. But interestingly, only cells exposed to the fibrillar form of alpha synuclein released the mature form of IL-1b. The investigators also demonstrated that this fibrillar alpha synuclein induced release of IL-1b required NLRP3 inflammasome activation, which appears to have been brought on by lysosomal dysfunction (the failure of phagocytosis of fribrillar alpha synuclein) followed by increased production of pro-oxidative agents being released into the cell. Taken together, these results suggested to the researchers that fibrillar alpha synuclein could act as a trigger for causing a strong inflammatory effect in Parkinson’s. Title: NLRP3 expression in mesencephalic neurons and characterization of a rare NLRP3 polymorphism associated with decreased risk of Parkinson’s disease. Authors: von Herrmann KM, Salas LA, Martinez EM, Young AL, Howard JM, Feldman MS, Christensen BC, Wilkins OM, Lee SL, Hickey WF, Havrda MC. Journal: NPJ Parkinsons Dis. 2018 Aug 15;4:24. In this study, the researchers wanted to characterise NLRP3 activity in the Parkinsonian brain, so they collected postmortem samples from 17 PD brains and 11 control brains. They found that the PD brains had higher levels of NLRP3 RNA than the control brains. When they looked specifically at the dopamine neurons in particular, the investigators found elevated levels of NLRP3 in these cells, AND that labelling of NLRP3 protein overlapped with labelling of alpha synuclein protein, suggesting a close relationship. The researchers also looked at the DNA of people with and without Parkinson’s (402 individuals with PD and 182 controls), and they found that genetic variations in the NLRP3 gene (which provides instructions for making the NLRP3 protein) were associated with a significantly reduced risk of developing Parkinson’s. Based on all of these results, the scientists concluded that inflammasome activity may impact the progression of Parkinson’s. Authors: Gordon R, Albornoz EA, Christie DC, Langley MR, Kumar V, Mantovani S, Robertson AAB, Butler MS, Rowe DB, O’Neill LA, Kanthasamy AG, Schroder K, Cooper MA, Woodruff TM. In this study, the researchers began by assessing postmortem human brains for signs of inflammasome activation. They used samples from 5 late-stage PD brains and 5 control brains, and they found evidence of increased cleaved caspase 1 and ASC in the PD brains. When they looked at which cell types were producing the markers of inflammasomes in the brains, they found that the resident immune cells – microglia – were activated and had increased levels of NLRP3 and ASC. Next the investigators looked at blood samples collected from 21 people with Parkinson’s and they found further evidence of inflammasome activation, suggesting that a ‘systemic’ (body-wide) increase in inflammasome activity may be occurring in Parkinson’s. The researchers then shifted their attention to animal models of PD, to determine if inflammasome activation is also occurring. Across multiple models (neurotoxin-based, genetic, and alpha-synuclein preformed fibrils), they found evidence of NLRP3 inflammasome activation. 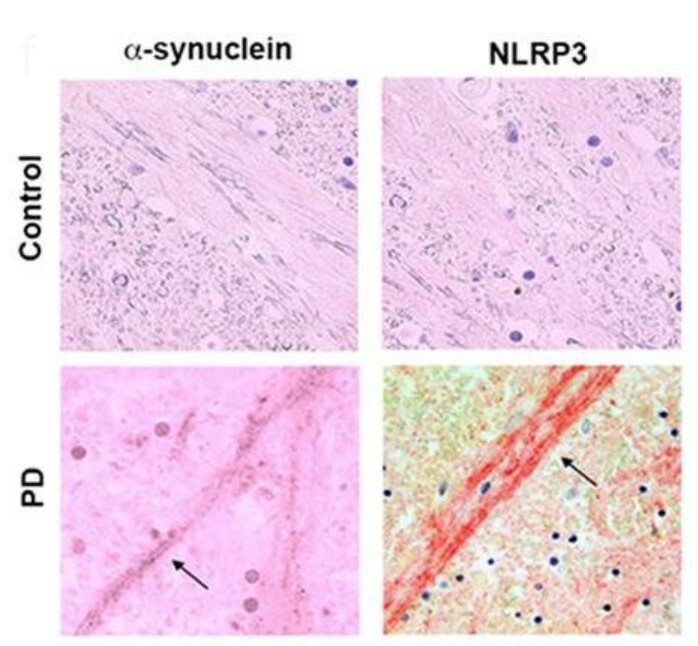 Given that fribrils of alpha synuclein can cause NLRP3 activation (see above), the researchers in this current study wanted to evaluate the response of microglial cells to preformed fibrils of alpha synuclein protein. They collected microglia cells from normal mice and mice that were genetically engineered to have no NLRP3. They grew these cells as separate cultures and then exposed the cells to preformed fibrils of alpha synuclein protein. They found that even when normal microglia were exposed to preformed fibrils of alpha synuclein protein, they would start to form characteristic ASC specks and release IL-1b 24 hours later. When microglia with no NLRP3 were exposed to preformed fibrils of alpha synuclein protein there was no release of IL-1b or formation of ASC specks (even at 24 hours after treatment). Interestingly, the alpha synuclein exposure did not cause pyroptosis in the microglia from normal mice. Given the lack of response in microglia with no NLRP3 protein, the investigators next exposed the normal microglia to a drug called MCC950. MCC950 is a potent small-molecule inhibitor of NLRP3. Some of the researchers involved in this current study, were also part of a previous study which identified MCC950. Authors: Coll RC, Robertson AA, Chae JJ, Higgins SC, Muñoz-Planillo R, Inserra MC, Vetter I, Dungan LS, Monks BG, Stutz A, Croker DE, Butler MS, Haneklaus M, Sutton CE, Núñez G, Latz E, Kastner DL, Mills KH, Masters SL, Schroder K, Cooper MA, O’Neill LA. Journal: Nat Med. 2015 Mar;21(3):248-55. In 2001, a set of diarylsulfonylurea-containing compounds were identified as potent inhibitors of IL-1b. In this more recent study, the researchers characterised of those compounds (named MCC950). They found that pre-treating cells with MCC950 inhibited ASC speck formation in pro-inflammatory situations, but curiously they also found that MCC950 does not prevent inflammasome formation (by directly blocking NLRP3 oligomerization or NLRP3-ASC interactions). The exact mechanims is still to be determined, but MCC950 was found to be a potent inhibitor of the NLRP3 inflammasome. In the more recent study, when the investigators exposed normal microglia to preformed fibrils of alpha synuclein protein and treated those cells with MCC950, they witnessed a significant reduction in NLRP3 inflammasome activation. Even at very low doses, MCC950 was able to block the release of IL-1b. As a result of this result, the researchers next turned their attention to models of Parkinson’s. Three models in fact. They tested MCC950 in a neurotoxin model (6-OHDA), a genetic model (MitoPark), and an alpha synuclein model of PD (pre-formed fibrils). Not only did the reasearchers find that MCC950 entered the brain (crossing the blood brain barrier is one of the great challenges of any PD-oriented treatment), but it also improved motor features and reduced the level of dopamine cell loss in all three of these models of Parkinson’s. In addition, MCC950 was found to be a potent inhibitor of inflammation in the brain, reducing IL-1b, Caspase-1, and ASC levels dramatically. Wow! This is really interesting. So summing up. What does it all mean? No wait. We’re not finished yet. We haven’t got to the really interesting part. The researchers were interested to have a look at what effect MCC950 treatment may have on the spread of alpha synuclein pathology in the pre-formed fibrils model of Parkinson’s. The analysed the brains of mice 8 months after the fibrils had been injected and they found signs of alpha synuclein in regions beyond the dopamine system in mice that were NOT treated with MCC950 (these regions included the cerebral cortex). In mice that were treated with MCC950 (following the delivery of pre-formed alpha synuclein fibrils), however, there was a very different picture: While there was no difference in the total amount of alpha synuclein being produced in the brain, there was a marked reduction in the number of alpha synclein aggregates. These results led the researchers to conclude that that chronic NLRP3 activation contributes to the propagation of pathology seen in the pre-formed fibrils model, and pharmacological inhibition of NLRP3 using MCC950 can effectively reduce this pathological process. Wow again! Are there any clinical trials of MCC950? This drug is being developed by a company named Inflazome. And they are hoping to start a Phase I clinical trials of MCC950 in early 2019. Phase I clinical trials are usually short in nature with the goal of determining whether the drug is safe in humans, at a range of doses. Once safety and dosing has been determined, the compound can move on to a Phase II trial which will provide an assessment of efficacy. Is Inflazome the only biotech developing NLRP3 inhibitors? No, Inflazome is definitely not the only biotech developing NLRP3 inhibitors. This is fast becoming a very busy area of research activity for pharmaceutical companies. In July 2016, Selvita and Epidarex Capital announced the formation of a new company called NodThera, which is focused on the development of NLRP3 inhibitors. And there is also Jecure Therapeutics (although it is fair to say that this biotech is primarily looking at liver inflammation and the treatment of non-alcoholic steatohepatitis (NASH) and liver fibrosis). Another biotech firm in this area is IFM Therapeutics (we previously mentioned them in the STING antagonists – another class of anti-inflammatory drugs being developed that could be useful in PD – Click here to read that post). IFM Therapeutics was bought by the pharmaceutical company Bristol-Myers Squibb in 2017, and while they are continuing to develop antagonists of the STING pathway, their primary drug candidate being prepared for clinical testing is an NLRP3 antagonist (Click here to read more about this). And on top of these examples, there are additional companies working in this space. We should see a lot of NLRP3 inhibitors going to clinical testing in the near future for a wide variety of inflammatory conditions. Ok, so what do we do while we wait for this drug to get to the clinic? So one thing readers should NOT do is to start playing/experimenting with broad anti-inflammatories. There are a lot of different anti-inflammatories widely available, but they have very different mechanism of action and over use (or abuse) of those drugs can have nasty side effects. There has been a lot of evidence to suggest that the anti-inflammatory Ibuprofen can reduce ones risk of developing Parkinson’s (Click here to read an example of the research), and this has resulted in a great deal of interest in this readily available anti-inflammatory medication. The problem is that over use of ibuprofen can lead to complications, in particular gastric bleeding. Health individuals who take high doses of ibuprofen on a regular basis are 3x more likely to experience gastric bleeding than those who do not take the drug. And significant gastric bleeding can be found in otherwise healthy people as early as three days after starting an ibuprofen regimen (Click here to read more about this). Thus, long term use of anti-inflammatory medication like ibuprofen is simply not an option. It would be an “out of the frying pan and into the fire” scenerio. Are there any natural inhibitors of NLRP3? There has been research published suggesting that certain readily available compounds have inhibitory activities on components of the NLRP3 pathway. EGCG (via green tea – not via supplement) has NLRP3 inhibiting effects – Click here and here for examples of the research, and click here to read a recent SoPD post about EGCG. For those interested in further reading on this topic, I can recommend a recent review of the research behind these (and other) natural inhibitors of components of the NLRP3 pathway – Click here to read that review. In addition, some of the compounds currently going through clinical trials for Parkinson’s may also have NLRP3 inhibiting effects. For example, the c-ABL inhibitor, Dasatinib have been shown to reduce levels of NLRP3 inflammasome activation (Click here to read more about this). It would be interesting to determine if Nilotinib has similar properties. In addition, GLP-1 agonists and Dipeptidyl peptidase-4 inhibitors appear to also have some NLRP3 inhibiting effects (Click here and here to read more about this). Interesting. Is this inflammasome stuff specific to Parkinson’s? It does not appear to be. Title: Microglia-derived ASC specks cross-seed amyloid-β in Alzheimer’s disease. Authors: Venegas C, Kumar S, Franklin BS, Dierkes T, Brinkschulte R, Tejera D, Vieira-Saecker A, Schwartz S, Santarelli F, Kummer MP, Griep A, Gelpi E, Beilharz M, Riedel D, Golenbock DT, Geyer M, Walter J, Latz E, Heneka MT. Journal: Nature. 2017 Dec 20;552(7685):355-361. In this study, the researchers found that ASC specks are released from cells and they latch on to the Alzheimer’s associated protein beta amyloid, and this can drive the assembly of the plaque aggregates that are found in the Alzheimer’s brain. 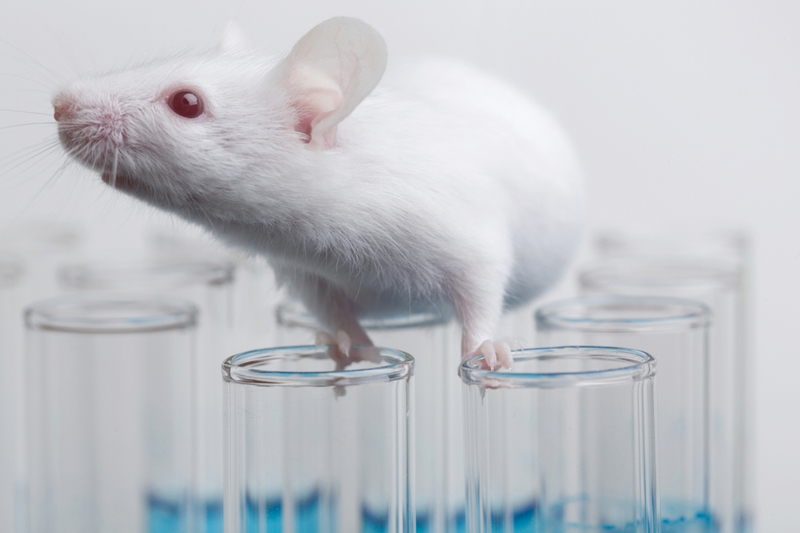 The researchers found that by genetically removing ASC specks from mouse models of Alzheimer’s, they could dramatically reduce the levels of beta amyloid plaque formation. They also found ASC protein inside beta amyloid plaques in samples of postmortem brains from people who passed away with Alzheimer’s, even in an early-stage patient with mild cognitive impairment (it would be very interesting to do a thorough analysis of Lewy bodies in Parkinson’s to determine if ASC specks are found in them). And it should be said, that some of the researchers involved in this study are working with the biotech firm IFM Therapeutics (mentioned above) – so watch this space! For those readers interested in learning more about this study, there was a useful editorial in the journal Nature on this report (Click here to read that) and an interesting discussion on the Alzforum website about it as well (Click here to read that). So why doesn’t everyone who has inflammation develop Alzheimer’s then? And all of this research needs to be replicated independently before we conclude too much. But it may be that inflammation is not an initiator of a particular neurodegenerative condition, but rather a fascilitator. Authors: Williams-Gray CH, Wijeyekoon R, Yarnall AJ, Lawson RA, Breen DP, Evans JR, Cummins GA, Duncan GW, Khoo TK, Burn DJ, Barker RA; ICICLE-PD study group. Journal: Mov Disord. 2016 Jul;31(7):995-1003. In this study, researchers in multiple Parkinson’s research centres across the UK collected blood samples from 230 people with Parkinson’s (and 93 control subjects). They next looked for markers of inflammation – inflammation is the result of an immune response to damage or infection – in serum. Serum is the component of blood when both blood cells and clotting factors have been removed. The investigators found that markers of inflammation were higher in serum from people with Parkinson’s than controls. And when they dug deeper into the data and focused on the PD group, the researchers found that high levels of “proinflammatory” marker (and low levels of “anti‐inflammatory” markers) were associated with more rapid motor decline (as measured by the UPDRS) in the Parkinson’s population over the 36 months period of the study (blood and clinical assessments were carried out at multiple times over those 36 months). They also found that higher “proinflammatory” levels were associated with lower cognitive scores at all of the assessment time points. Thus, it may be that inflammation is a fascilitor of the disease process, and hopefully by reducing levels of inflammation we will be able to slow down the progression of the condition. Australian researchers have very recently demonstrated that components of the NLRP3 inflammasome pathway are elevated in the Parkinsonian brain. They have also presented data using multiple models of Parkinson’s, that suggest inhibiting the NLRP3 inflammasome pathway could slow the aggregation of the Parkinson’s associated protein alpha synuclein (which may be involved with causing the inflammation). We often talk about the three core requirements of any ‘curative’ treatment for Parkinson’s (Click here to learn more about this). The first of those core requirement is a disease halting mechanism. If MCC950 is found to be effective in humans that slowing the spread of alpha synuclein pathology, this would potentially be a disease slowing mechanism. It will be very interesting to see this being tested over the next few years (both in the lab and in clinical trials). And it will be interesting to see how different sub-types of Parkinson’s respond to NLRP3 inhibitors. For example, such a treatment could be of particular useful in PARK2/PARKIN-associated Parkinson’s as the absense of PARKIN appears to increase the impact of the NLRP3 inflammasome (Click here and here to read more about this). I think I’ll stop here. In addition, many of the companies mentioned in this post are publicly traded companies. That said, the material presented on this page should under no circumstances be considered financial advice. Any actions taken by the reader based on reading this material is the sole responsibility of the reader. None of the companies have requested that this material be produced, nor has the author had any contact with any of the companies or associated parties. This post has been produced for educational purposes only. Surely, there must be some middle ground between doing nothing and doing something: between waiting for MCC950 trials to conclude (years) and taking too much ibuprofen now (seconds) or too little EGCG, via green tea, for it ever to be effective (weeks). Thanks for your comment – sorry I stole your thunder. I am all ears if you have some ideas regarding that middle ground between doing nothing and doing something. In search of the middle ground in assessing the use of potential therapies (PT): actions that are considered a promising way to treat PD, but which have not been through the whole trial process. At the moment, unless one has a particularly brave doctor, it is all or nothing: a PT is only going to be prescribed if it has passed its clinical trials. One day it is deemed useless. The next day it is thought to be a world beater, a therapy rather than a PT. This is clearly nonsense. The real situation is that as we use a PT we gradually gain in our knowledge of its benefits and costs. Put another way, on a day by day basis the probability that it will eventually be approved goes up and down. I write about how PT that by their nature or by our long experience of them in other domains are probably safe. Examples of PT that I would include in this are green tea and curcumin. Examples of PT that I would exclude are DBS and smoking. The probably safe PT should have a greatly simplified regulatory system. Other PT should continue to have the same clinical trials as at present. The simplified regulatory system would have, in effect, an ethics committee who would take into account everything that is known about the PT, the theory, the animal tests, the early results of human use, etc.. They should take into account the opportunity costs of not going ahead with a PT. They would give or withdraw provisional approval. Crucial to the success of this policy is that measurements of the safety and efficacy of the PT continues while it is in use. Thanks for this clear explanation Simon, along with the link to the video. I understand about not experimenting with medication, but I am curious – is this an area where diet/nutrition might make a difference? I’ve a sudden urge to increase my green tea intake. Thanks for your comment – I have a cup of well-brewed Japanese green tea every morning. As for diet, I would recommend you read the post I wrote about the research of Dr Laurie Mischley last year (https://scienceofparkinsons.com/2017/09/18/food/). Her data suggests that there are certain foods that are more influential in the speed of PD progression – some foods to be avoided. Sencha or macha? I’ve run out of my latte grade macha and am wondering if I should switch to sencha. Thanks for the interesting question. From what I have read Matcha green tea has more EGCG than Sencha green tea (https://www.ncbi.nlm.nih.gov/pubmed/14518774). Enjoy your next cuppa! What do you think of that other Japanese superfood, natto? PQQ, K2, nattokinase*, spermidine – what’s not to like about it ( except for the taste and texture). However I’ve been reading that although spermidine increases autophagy, it also might enhance alpha-synuclein aggregation. So I guess it should be avoided? Perhaps certain other high polyamine foods, as well? Thanks for the interesting comment/question. Autophagy is a difficult thing to balance (as Ben Stecher’s blog recently pointed out – https://tmrwedition.com/2019/02/15/interview-with-autophagy-expert-prof-david-rubinsztein/). Too little autophagy and things go wrong; but too much autophagy and things can also go wrong – and our clinical/biological measures of autophagy are not great so it is a very tricky business trying to get the right balance. I don’t know enough about nattokinase to make any comment, except that I note it lowers blood pressure. As always I would only recommend that folks talk to their clinician before changing anything in their treatment regime. Great post as usual.I would like to express big thank you to you for continuing this blog. It is amazing that compound MCC950 is known for 20 years and never has been tested for neurological diseases. You tell us about one one amazing cure pathway after another and they all go to nowhere after. I am also amazed about enormous time and cost of trails. Is it impossible to find 3 volunteers scientists who do trial for free and fast? I am sure plenty of PD sufferers will do trial also for free. Also I would like to ask about natural NLRP3 inhibitors: which one is most powerful ? One of my concerns with writing about a lot of the material on the SoPD is that they may result in raising expectations/hope. This has never been the goal. It has only ever been about making folks aware of what research is going on, explaining in more depth some of the research in the headines, and encouraging engagement/discussion of the research. I appreciate, however, that a little bit of information can be a dangerous thing. Martin Taylor has recently written a very good write up about this issue (https://medium.com/parkinsons-uk/balancing-hope-and-hype-in-parkinsons-research-38f207871a3d). It was shocking to discover that MCC950 has been sitting around for a while, but it is only recently that there has been a major shift in the idea that inflammation and inflammasomes are potentially playing a major influencer role in neurodegeneration. I suspect given the impact of this new Aussie research report that a lot of research in this area will follow. It is difficult to state clearly which of the natural NLRP3 inhibitors is the most potent because there hasn’t been any comparative studies that I’m aware of (and I would be pleased to be corrected on this), and most of the studies thus far have been in different models of other conditions. The review mentioned in the post above suggests that resveratrol, curcumin, EGCG, and quercetin have been the most studied. Really interesting. Thanks. I’m also hitting the green tea. Glad you liked it. I’m currently drinking my green tea. As everyone says over and over, thank you for the article. Two questions: 1) Given your scientific sleuthing abilities can you find a paper written by Harry Orr proving that it was “misfolding” that caused ATXN-1 to be toxic and not the aggregation and 2) Do you believe misfolding of proteins in the brain can make some proteins toxic? Regarding your first question, is the following link of any help? I hope all is well – thanks for the intersting comment. 1.) Prof Harry Orr (Universtiy of Minnesota) has done rather a lot of research on ataxin-1, most recently (2 weeks ago) he published this interesting report on an antisense oligonucleotide approach in a mouse model of SCA1 (https://www.ncbi.nlm.nih.gov/pmc/articles/PMC6238731/). Note that a biotech company called Ionis Pharmaceuticals, out of Carlsbad (California) is involved with this study. You may remember Ionis was the company that earlier this year published Phase I/II clinical trial results demonstrating a large reduction in aggregated protein in people with Huntington’s using the antisense oligonucleotide approach (http://ir.ionispharma.com/news-releases/news-release-details/new-data-ionis-htt-rx-phase-12-study-demonstrates-correlation). Whether this approach is curative in HD is yet to be determined in Phase II/III trial which is being set up as we speak. Ionis don’t currently mention SCA1 in their pipeline (http://www.ionispharma.com/pipeline/), but given this recent report from Prof Orr, we can assume they may be lining it up. Prof Orr also published a report suggesting that inhibition of ATXN1-capicua protein complex could also be an approach for SCA1 (https://www.ncbi.nlm.nih.gov/pubmed/29526553). Inhibiting capicua is a delicate balancing act though (https://www.ncbi.nlm.nih.gov/pmc/articles/PMC5715262/). But it is encouraging. 2.) I am unclear about misfolding proteins being toxic. Cells have lots of check points and are very good at identifying & disposing of misfolded proteins. So it is likely that misfolded proteins are indicative of something else (a break dow in the protein checks) going badly wrong, and it could be that other thing that causes the trouble. 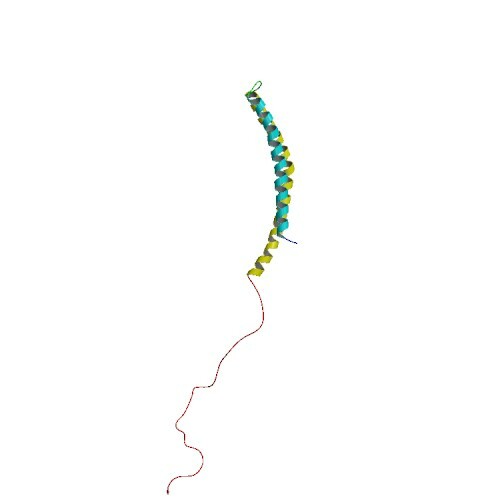 In addition, some ‘misfolded’ proteins could be a defensive mechanism against foreign agents, tying them up (https://scienceofparkinsons.com/2016/05/29/a-change-of-dogma-for-alzheimers-disease/). So misfolded proteins could actually be a good thing. So I remain on the fence. The annoying thing is that if you google around, there are dozens of companies that produce this relatively simple compound for research use..albeit at a hefty price and not for human use, so why on earth does it take so long for the clinical trials?! The speed of clinical development is extremely frustrating. It is party regulators doing all their checks and not having enough resources to do it all quicker. They try to cover all of the bases and request a great deal of information from parties trying to take compounds to the clinic. But it is also a case of Parkinson’s being such a slow progressing condition – it takes time to see if an experimental medication is having an effect. We need better biomarkers/methods of assessing PD to speed things up in this regard. And then there is also the issue of recruitment of participants in clinical trials. It is entirely a personal matter for everyone to decided if they want to get involved in a clinical trial or not, but most research centres have very slow recruitment (2-5 subjects per month is average). This is another factor slowing things down. We need to find remedies for all three of these things. thankyou for this, I was interested to read about the neutrophils, I have parkinsons and have had low neutrophils for at least 10 years. I wonder if you know of any significant connection? Thanks for your interesting comment. Based on what I’ve read, the half-life of MCC950 varies between 2.5-3.5 hours in rodents. I’m not sure if Pfizer (the original developer of MCC950) ever reported anything about this in humans. So you are may be right. It should be noted, however, that Inflazome are not going to the clinic with MCC950, but rather they hope “to launch a Parkinson’s trial sometime next year with one of Inflazome’s next-generation NLRP3 inhibitors” (https://www.nature.com/articles/d41587-019-00005-8). Between now and then, they will be Phase I safety/tox. testing that “next generation inhibitor”, which most likely has a long half-life. Seems like it has more to do with MCC950 being off-patent than anything else. Didn’t they feed the mice MCC950 via their water (or was that another study, I’m losing track…)? Would anyone with PD (or AD, or any number of other really nasty conditions) mind sipping a bottle of MCC950 water throughout the day? There are some additional reasons for not taking MCC950 directly to the clinic. I understand that there is some preclinical toxicology data on MCC950 indicating some off-target activity which makes it not ideal for clinical evaluation. These kinds of things have hopefully been engineered out – hence the shift to safer next generation derivatives by Inflazome. I have a Familial Mediterranean Fever gene variant (defective pyrin), and I get bouts of joint pain and inflammation with general malaise. I’m also heterozygous for MCAD deficiency and partially symptomatic for that, as well. I take vitex (chasteberry) for menstrual cycle regulation but ran out and have been waiting for my shipment for a few days. I’m now having a flare up of ‘aches and pains’, so I checked into it and found that orientin, a constituent of vitex, modulates NLFP3 (as well as a bunch of other inflammation related pathways). Feverfew (parthenolide) and luteolin are also supposed to act on NLRP3. I doubt any of them are particularly efficacious for PD or AD, though, or we’d know already. Feverfew does have a reputation for migraine prevention, however. Thanks for the interesting comment. Sorry to hear of your condition – I hope the treatment shipment issue is now resolved. Some researchers have looked at orientin in the context of neurodegeneration (for example: https://www.ncbi.nlm.nih.gov/pmc/articles/PMC6248275/), and luteolin has been assessed in models of PD (for example: https://www.ncbi.nlm.nih.gov/pmc/articles/PMC4028259/, https://www.ncbi.nlm.nih.gov/pubmed/18952146 & https://www.ncbi.nlm.nih.gov/pmc/articles/PMC5201116/). Very few stones are being left unturned in the search for novel therapies for PD. This is a fantastically written article that crams in a lot of technical info. As you pointed out the half-life may be problematic. I would expect a slightly different molecule to go into clinical trials, something with improved pharmacokinetics. Thanks for the comment and information provided. I was aware that Pfizer had tested CP-456773 in man, but not aware that it was RA. Thanks for that. Will look into it and let you know what I find. At Inflazome, he has been a key member of the team driving IZD174 toward clinical trials, currently expected in 2019. I wonder if IZD174 is the new drug that will be replacing MCC950.